Markham, 2016-03-30 - Z3 Controls today announced that the NetMeter family of energy monitoring and submetering devices have been incorporated into the Bill Fisch Forest Stewardship and Education Centre, recently unveiled by the Regional Municipality of York. This single-storey, 4,000 square foot structure, is constructed with a goal of achieving Living Building Challenge certification. Currently, there are only eight buildings in the world that have attained this designation. Z3 Controls NetMeter family products (the 3P for electricity and the OMNI for water and gas) are an integral part of the building's real-time monitoring and data-logging system. Z3 Controls sub-meters capable of monitoring and measuring electrical use, water and gas, in real-time, to a high degree of granularity and accuracy. By targeting both LEED® Platinum and the more demanding Living Building Challenge Certification, the region is pursuing the most ambitious certifications in the world. 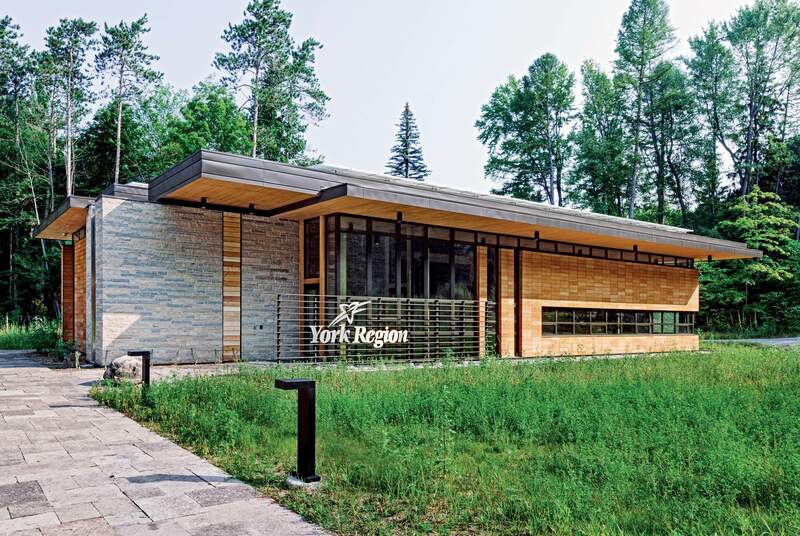 York Region’s objective for the Bill Fisch Forest Stewardship and Education Centre is to achieve ‘net zero’ water and ‘net positive’ energy performance. 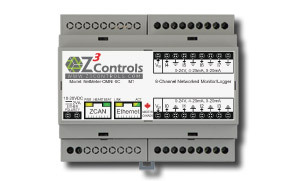 Z3 Control sub-meters monitor, measure and data-log both the energy consumed and the energy generated. Energy: Electricity generated by solar panels is expected to produce as much energy as the building uses in one year. Water: The facility captures rainwater, returning it to the watershed as clean as when it entered the facility. Z3 Controls will continue to work closely with York Region’s energy engineers, general contractor and sub-contractors to achieve full LBC certification. Z3 Controls Inc., headquartered in Markham, Ontario, is an advanced energy technology company that designs, manufactures, and markets energy monitoring, measurement, data-logging, dashboarding, and analytics information systems that enable corporate energy consumers to achieve energy efficiency and control costs. Z3 Controls Inc. is a global supplier of energy savings and conservation solutions for the Industrial, Commercial, Institutional and Municipal segments with adoption in industries including Automotive, Paper Mills, Plastics, Metallurgical, Mines, Motors etc. as well as Food and Beverage, Government and Critical Infrastructure (Water, Waste Water, Water Treatment), and Gas. We work closely with LDCs (Local Distribution Companies) and Utility companies and assist in their energy conservation initiatives. These solutions enable large utility clients to create the most energy-efficient programs and conservation plans. For over 4 years, Z3 Controls Inc. has been servicing customers directly as well as through global distribution partners located throughout the Americas. 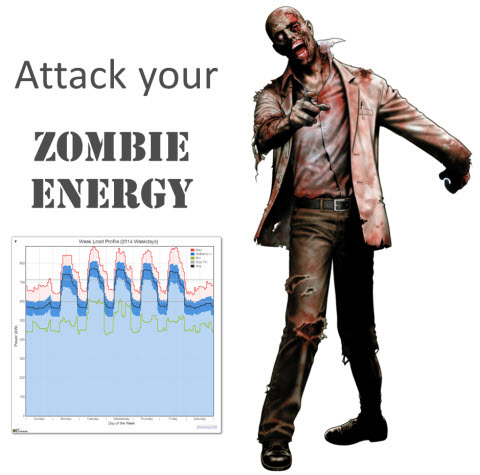 Learn about how to measure "Zombie Energy" with new tools from Z3 Controls. Also on display: a live demonstration of a complete energy management solution. Z3 Controls will be demonstrating a solution for complete energy management at the the Energy into Action Conference in October. The demonstration features the NetMeter-OMNI and NetMeter-3P working together to provide a combined solution for monitoring almost any type of energy or commodity: electricity, gas, water, steam, air, and much more. Z3 Controls will be exhibiting at the the Advanced Manufacturing Expo in September. 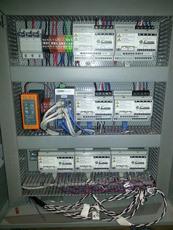 See a demonstration of our complete energy monitoring solution featuring the NetMeter-OMNI and NetMeter-3P. The demonstration will showcase the NetMeter-OMNI and NetMeter-3P working together for combined electrical and non-electrical energy and environmental monitoring. Z3 Controls has been recognized by the City of Markham as a leader in green business. This video highlights how Z3 Controls is helping the City and the Region of York. Z3 Controls will be exhibiting at the the Energy into Action Conference in February. 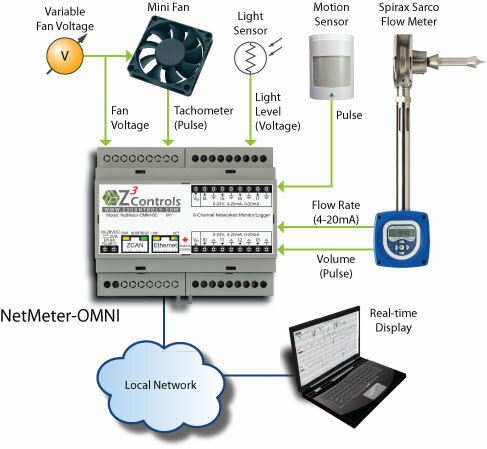 See a demonstration of the new NetMeter-OMNI product! The demonstration will showcase the flexibility and ease-of-use of the NetMeter-OMNI. Z3 Controls is pleased to announce availability of the NetMeter-OMNI: a versatile 8 channel meter, monitor, and data logger. Each of the 8 independently configurable channels can be used with almost any sensor that outputs either a voltage (up to 24V), a current (4-20mA), or with contactors such as KYZ pulse output devices. 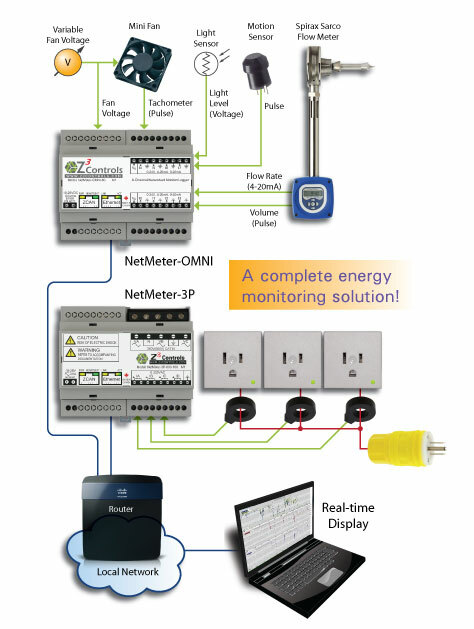 Together, the NetMeter-3P for electricity and the NetMeter-OMNI provide a complete solution for energy, environmental, and process monitoring. The NetMeter-OMNI is available now: contact sales or browse the NetMeter-OMNI product page for more information. Z3 Controls will be exhibiting at the the Energy into Action Conference in September. Z3 Controls participated in the spring Energy into Action Conference and found it to be a very worthwhile learning/networking opportunity. Z3 Controls invites customers and visitors to explore its new website. The new website has been designed to provide a user-friendly experience with improved navigation and functionality throughout, allowing customers to access detailed product information and videos, online help, and tighter social networking integration. 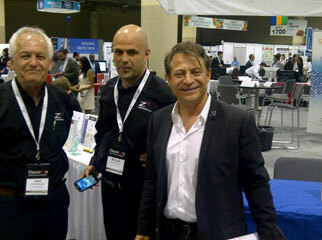 Z3 Controls Inc. was honoured with a visit from keynote speaker Peter Diamandis at OCE Discovery 2013. Intrigued by the NetMeter booth demonstration, Peter Diamandis discussed, with Z3 Controls, the company's products and technology as well as future technological trends. We agreed to keep in touch with Peter and his X-Prize Foundation to discuss future technological advances and developments. Dr. Peter Diamandis is the Chairman and CEO, X Prize Foundation(SpaceShipOne); Co-Founder and Chairman, Singularity University; futurist and New York Times best-selling author, Abundance: The Future Is Better Than You Think. 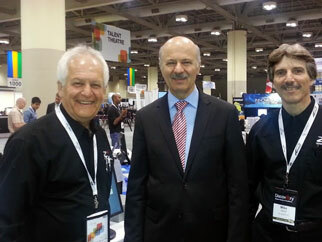 In addition to Peter's visit we also had the privilege of meeting with the honourable Reza Moridi, Ontario Minister Of Research And Development. During this year's PLAST-EX show at the Toronto Congress Centre, the NetMeter product from Z3 Controls Inc. was prominently featured at the Absolute Haitian booth. 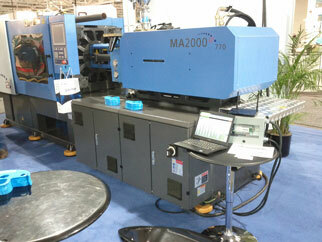 It was used effectively to demonstrate the energy efficiency of the Haitian Injection Molding Machine. Energy efficiency was a key topic at the show as was evident from the steady traffic at both the Z3 Controls booth and the Haitian live exhibit. A new document from Honeywell, describes Enterprise Buildings Integrator™ (EBI) support for the NetMeter energy monitor from Z3 Controls. Honeywell Enterprise Buildings Integrator offers comprehensive automation for all of your building systems. The new document "Z3 Controls EBI Integration" documents integration of the NetMeter with Honeywell EBI for quick incorporation of NetMeter devices into your application. Contact Z3 Controls for access to the document.